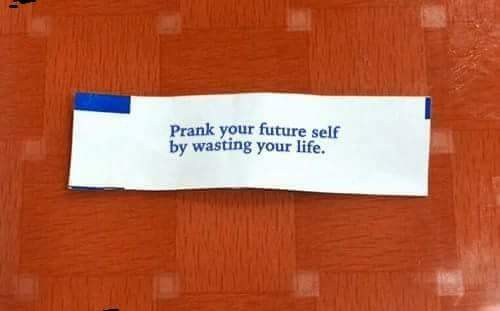 Prank your future self by wasting your life. This made me laugh out loud. I think the reason I found this funny is partially because I think the concept of “wasting” one’s life is actually ridiculous. What is the purpose of life? Who is to say? Is it to gather wealth? Is it to gather knowledge? Is it to gather spiritual insight? Is it to be kind to our fellow man? Maybe it is to ascend to the highest possible level on World of Warcraft. Whatever we do in our lives, we cannot help but live. We cannot help but gather life experiences, both good and bad. Who is to judge the quality of these experiences and decide what constitutes a “waste”? There is a Buddhist description of life I once read that describes it as “one continuous mistake”. That is life. Also, I read something that was written by Thich Nhat Hanh, Buddhist monk, about trees: he made the point that we run around trying to figure out what we should do and how we should act — but we see that a tree has inherent value — we do not ask what the tree has accomplished or criticize trees for not quite making it — a tree is successful by simply being a tree; human beings, similarly, need only exist. No great accomplishment is necessary and none will last anyhow. I am curious to know your thoughts on this in the comments below. humor, humour, prank your future self, the purpose of life, Thich Nhat Hanh, trees, wasting life. Bookmark.